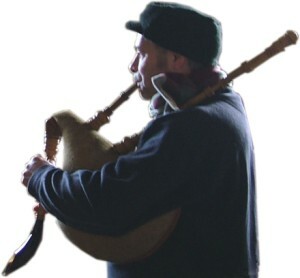 In Welsh the pipes are referred to as pibgod, cotbib or pibau cŵd. One of the Welsh law books, the Black Book of Chirk, states that every King that employs a Pencerdd must give him an instrument: a harp to one, a crwth to another and pipes (pibau) to the third, each one according to his skill or custom (herwydd ei arfer); and when that Pencerdd dies the instrument must be returned to the King. These laws are associated with the name of Hywel Dda, from the tenth century. In the twelfth century, Giraldus Cambrensis confirms that the main instruments of the Welsh people are harps, crwth and pipes. In the fourteenth century, the poet Iolo Goch refers to a chwibanogl a chod – a pipe and a bag. And in the church of Llaneilian in Anglesey there is a fifteenth century carving of a piper with a pipe in his mouth and a bag under his left arm. In his book on the history of Brecknockshire, Theophilus Jones describes a wedding in 1852 – a wedding on horseback, an old tradition in some parts of the country. He longs for the days when a piper (dead by that time) would always appear at these ceremonies. An old piper could be seen with a huge wind bag under his left arm, and at the time we assumed he was a Welshman and that he lived in that part of the country, because he was too old to have travelled there from other countries. It appears therefore that the pipes were still played here and there in Wales many years after the pibgorn had disappeared.